Do you have a fascinating Davis story to add to our database? Send us anything that you find interesting and we'll post it on our Story pages. 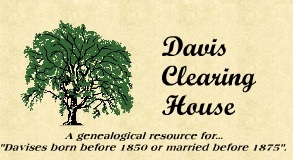 If you are a Davis researcher or have a Davis married into your family, let us hear from you. If you know your ancestor was a blacksmith, doctor, lawyer or Indian chief .... let us know, maybe - JUST MAYBE - we can help. Please let us hear from you - even a phrase like John the blacksmith helps! Middle names and unusual names are especially helpful! We might be able to place them into a family for other researchers or even give you a report on other researchers of your extended line. Open your files and put your name in history. Again, no Davises born after 1850 or married after 1875 are included in our database so please do not send or ask for information in the 1900s. All inquiries processed in order received.